Which packing and shipping methods are preferred for orange juice products. The alternative ways bulk FCOJ is shipped over land and sea. What happens to bulk FCOJ en route from Brazil to Europe. How overseas shipments of frozen and aseptic NFC are handled. The advantages of shipping NFC in bulk rather than in retail packages. The factors that determine shipping costs. Dedicated terminals for receiving bulk FCOJ and NFC. Operations carried out by blending houses. Shipping of orange juice products is dominated by bulk shipments, mainly of frozen concentrate. However, in US significant quantities of NFC are filled in consumer packages in Florida before distribution to other states. Frozen concentrate is shipped in tanker ships, conventional cargo vessels, railway tanker wagons, road tankers and drums. Some concentrate is filled in aseptic bag-in-box containers. Transporting FCOJ from Brazil to Europe is now a very streamlined, cost-effective and time-saving process. Bulk NFC is stored chilled under aseptic conditions or frozen. Aseptic product may be shipped under chilled or non-refrigerated conditions. Special ships with refrigerated aseptic tanks transport NFC from Brazil to the US and Europe. Shipping bulk NFC for retail packing in overseas consumer markets is more economical than shipping NFC products in retail packages. Shipping costs depend on mode of transport and prevailing freight rates. The sales price of bulk product usually includes the cost of the bulk package, and often the cost of transport to the import terminal. Dedicated terminals for bulk FCOJ are found in Brazil and in major juice-importing regions. Some terminals now have facilities to handle bulk NFC under aseptic conditions. Products in storage tanks are held under nitrogen atmosphere to protect them from oxygen. The complex terminal operation is controlled by a modern automation system. Blending houses supply concentrates (and NFC products) of defined and consistent quality to juice packers. A wide range of raw materials is used to prepare the concentrates and bases, often made to customer-specific recipes. Orange juice consumption in Europe, the Far East and the US (with regard to imported Brazilian juice) requires shipping large quantities of juice products over long distances. Transport costs constitute a significant part of the bulk product price, typically 15-20 %. Hence, efficient control of the transport chain is important. Outside the US market, by far the dominant product shipped is bulk frozen concentrated orange juice (FCOJ). Although overseas exports of not-from-concentrate orange juice (NFC) are increasing, they are still relatively small on a global scale compared with FCOJ shipments. When NFC is shipped overseas it is predominantly in the form of bulk product. Dedicated ships fitted with bulk tanks transport NFC under aseptic chilled conditions from Brazil to the US and Europe. NFC is also shipped in frozen drums or aseptic bag-in-box. Long-distance overseas shipping of juice products in retail packages is rare for cost and logistics reasons. However, some Florida juice and some juice products from South Africa, Australia and elsewhere are exported overseas in retail packages. bulk form is transported chilled by road and rail tanker in Florida and to juice packers in other parts of the US. Nevertheless, the majority of Florida NFC is still packed in consumer packages at fruit processing sites and distributed by truck or train under refrigeration. Similarly, but on a smaller scale, NFC produced in Spain is transported to the European market both in consumer packages and in bulk in refrigerated road tankers. Frozen concentrate for home dilution was once the flagship of Florida orange juice. It has given way to ready-to-drink juices and now represents less than 5% of US orange juice retail volumes, measured as diluted juice. It is retail-packaged (typically in 12-ounce composite cans) in Florida and distributed frozen. The international transport chain for bulk orange product is shown in Figure 6.1. Strong growth in concentrate exports from Brazil in the 1970s and 1980s led to significant developments in the juice transport logistics chain. Orange concentrate is shipped in tanker ships, road tankers and drums. For shipping in tankers, the product is typically kept at -8 to -10°C. For drums, the product is commonly packed in 200-litre (55-gallon) steel drums with double polyethylene liners and stored frozen at -18 to -25 °C. Some concentrate, in limited quantities, is also packed in aseptic bags using drums or wooden bins for outer support. Aseptic bags of concentrate are typically put into frozen or chilled storage at the producer site. However, as aseptic bags do not require frozen conditions, they allow more flexibility – and potential cost-savings – in the transport chain. In some markets, frozen conditions cannot be guaranteed throughout the entire transport chain. Alternative ways of transporting concentrate by land and sea are listed in Table 6.1. The transport of FCOJ in bulk tanker ships is made easier by special port terminals. Such dedicated quayside facilities can now be found in the main export regions and in the largest import markets for orange concentrate, such as the US East Coast, Western Europe and Japan. The major Brazilian processors have built their own terminal facilities in Brazil, Europe and Japan. Today there are a number of large tanker ships constructed solely for transporting FCOJ and other citrus products in bulk. Tanker capacities are in the range of 6,000 to 15,000 tonnes of product. Some of the major Brazilian processors run their own ships for bulk orange product. Drummed concentrate can be shipped in conventional cargo vessels. Two common ways of shipping FCOJ in drums are as “break bulk” and in freight containers. For “frozen break bulk”, the drums are loaded individually into a refrigerated compartment in the vessel. Alternatively, drums (often on pallets) are put into “refrigerated containers” (reefers) that are loaded into the ship. At the point of import the same container can be used for land transport by truck to the end user. Shipping rates are lower for break bulk than for refrigerated containers, but drums in break bulk require more handling at the exporting and importing ends. The handling of FCOJ in bulk tankers requires heavy investment in infrastructure like ships and special dockside terminals. Once these are in place, however, it is a more efficient way of transporting large product volumes compared to drums or returnable containers. The total cost for drum transport should take into account both the cost of drum manufacturing or reconditioning and potential disposal charges. Drums often have no use in the importing region, in which case the juice packers must pay to dispose of them. Nevertheless, drums are likely to remain the most appropriate shipping container for smaller producers, regions with low production levels, special quality concentrate, and so on. Refrigerated container (reefer) An insulated container with a refrigeration unit that can be set at the desired temperature (chilled or frozen). Dry container A regular container for transportation at ambient temperature or under non-refrigerated conditions. FCOJ handling during bulk storage and shipping has precise engineering requirements. Many are related to the sharp increase in viscosity of juice concentrate when it is cooled to normal bulk storage temperatures of -10°C. At the TASTE evaporator outlet, viscosity of 65°Bx concentrate is in the range of 300 cps. It increases more than 20-fold (to 6,000-7,000 cps) inside the bulk tanks at typical storage temperatures. This necessitates correct design calculations for pumps and transfer lines (the latter are commonly 6 inches or larger). Moreover, engineers must take special care when designing FCOJ transfer pumps because the available suction pressure (net pressure suction head or NPSH) is low during the final step of emptying storage tanks. Choosing appropriate pump types and and calculating pressure losses correctly are crucial for successful operation. Another concern is avoiding crystallization of potassium citrate (entrapped with hesperidin) during final cooling of FCOJ in plate heat exchangers before bulk storage. Crystallization fouls the inside of the equipment, leading to an increased pressure drop or the creation of preferential channels in the heat exchanger, thereby reducing the cooling performance. The process design needs to take this into account. The risk of crystal formation increases when processing juices with a low Brix/acid ratio. Today, transporting FCOJ from a production site in Brazil to a European juice packer is a logistically streamlined, cost-effective and time-efficient process. Most orange production in Brazil is in São Paulo state. The distance from the fruit processing plants to the Port of Santos export hub ranges from 400 km to 800 km. The FCOJ is transported to Santos by road tanker, and a continuous fleet of dedicated trucks makes the journey to and from Santos round the clock. Once unloaded from road tankers, the product is stored in dockside tanks at -10°C under a nitrogen blanket. Orange concentrate shipping schedules are closely controlled. As soon as the bulk tanker ship arrives at Santos, the stored product is pumped on board. Total loading is completed in 24-36 hours. The ship’s tanks are filled completely to allow little or no headspace. The crossing to Europe typically takes 13 days. En route the product and its environment are continuously monitored. The ships arrive in Europe at ports with dedicated dockside facilities to receive FCOJ. Large positive displacement pumps (for 8-inch piping) on board the ship pump the FCOJ directly into storage tanks on land. Also unloading a full vessel can be done in 24-36 hours. After unloading, the ship takes in ballast and starts its return voyage to Santos. The ship may also take freight containers on deck for the return voyage. Except for the transport by road tankers in Brazil, juice concentrate is maintained under a nitrogen blanket from processing plant storage to European terminal storage. For the return trip to Brazil, the ship’s empty tanks are not cleaned but remain under nitrogen conditions. There are two alternative ways to store bulk NFC – chilled under aseptic conditions or frozen. Aseptic product is usually shipped in chilled conditions, though sometimes refrigeration is not used. Frozen (non-aseptic) product must be transported under freezing conditions. Unlike concentrate, which is highly viscous but still pumpable when frozen, NFC freezes solid. Because pumping frozen NFC into or out of tanks is impossible, it must be frozen, stored and transported in individual containers. The expansion of NFC production in Brazil at the end of the 1990s led to the development of bulk sea transport for chilled aseptic NFC. 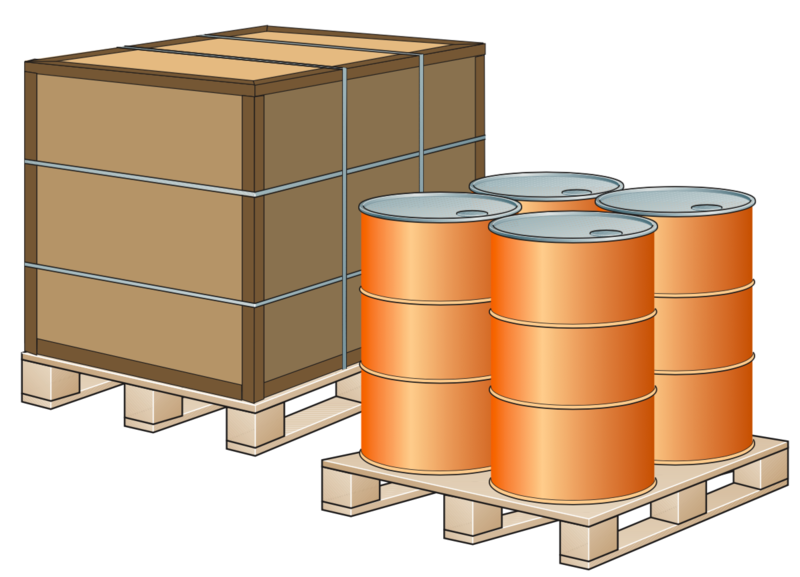 For frozen shipments, NFC is usually filled into 200 litre (55 gallon) drums with plastic inner liners. It takes several days or even weeks for NFC in drums to freeze solid. Larger unit sizes would be desirable for economical reasons, but the technology for quick freezing/thawing of larger NFC unit sizes for shipping has not gained wide commercial acceptance. Single-strength juice starts to freeze at around -2°C. When frozen in drums, NFC does not freeze homogenously. As water forms ice crystals, a gradually more concentrated juice solution is left behind with an accompanying slow decrease in the freezing point. The reverse process occurs when the product thaws in drums. As a result, the first melted portions have a lower °Brix content than completely liquid juice. Freezing causes NFC to expand. Hence, standard 55 gallon drums are typically filled with NFC to only 45 gallons. As with drummed FCOJ, NFC in drums is shipped as frozen break bulk or in refrigerated containers. Several different types of bulk units exist for shipping aseptic NFC. One-tonne aseptic bag-in-box units are the most commonly used. The units are normally shipped in freight containers, either refrigerated or ambient. Aseptic bags are multilayer plastic bags with a barrier layer – normally aluminium foil – to minimize oxygen ingress during storage and transportation. The bags require an outer support, usually a bin made of wood or cardboard. Wooden bins are collapsible and returned for reuse (see Figure 6.2). Cardboard bins are normally used only one-way. Bin dimensions are chosen so they can be efficiently stacked into the freight containers used. Unit size may therefore vary between different bag-in-bin users, but lies typically in the range of 900-1,200 litres (240-320 gallons). There is little or no headspace in the bags. Stringent demands must be placed on the integrity of aseptic bags used for NFC. It is a liquid that flows freely inside a bag restrained by an outer support – unlike, say, tomato paste, which is highly viscous and hardly moves. Whether chilled or ambient conditions are used, asepticity must be maintained throughout the transport chain because reinfection of an individual bag may cause the bag to blow. Thus, the good handling procedures in common practice today must be followed closely. When a product reaches the juice packer, NFC is emptied from the aseptic bag either by cutting open the bag and removing the juice with a hose pump placed inside the bag, or by pumping out the product through a separate emptying spout (controlled emptying). Alternatively, an aseptic unloading station can be used to pump juice out from the bag under aseptic conditions followed by aseptic transfer to retail packaging. As product sterility is maintained, the juice does not need to be repasteurized prior to retail packaging. The handling and processing steps for NFC via the frozen route and the aseptic bag-in-box route are shown in Figure 6.3. Aseptic totes are an alternative to aseptic bag-in-box containers. The totes are mobile stainless steel tanks (1,000–3,000 litre product volume). They are steam-sterilized and pressurized with nitrogen before filling. They may be used for storage and transport of NFC. However, totes are mainly used for short-term storage and transport over short distances because of the high investment and freight costs (including return freight) involved. Much larger juice quantities can be packed in aseptic transport containers. These are mobile aseptic tanks of 20,000 litres (5,000 gallons) or more and of varying designs. Some are built inside a freight container and transported as such; others take the form of self-contained tanks sized to fit into trucks, ships and trains. 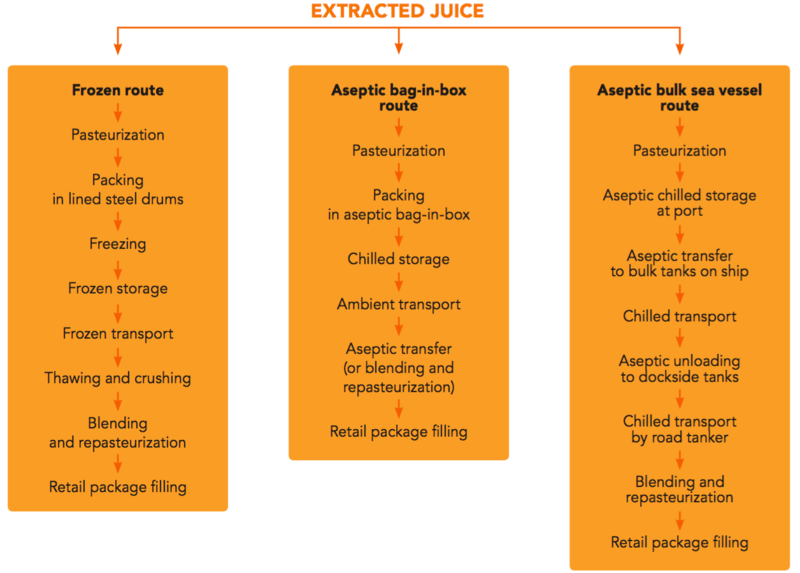 Aseptic transport containers can also be used for on-site storage of juice product before it is shipped from the processing plant. Although the large unit sizes of transport containers provide better economy of scale for handling aseptic NFC, the cost risks associated with faulty operation or unsterile juice are much larger. While NFC (single-strength orange juice) produced in Florida is mainly packaged locally or delivered overland to juice packers in the rest of the US and Canada, NFC from Brazil and other regions is mainly destined for bulk export overseas. During the late 1990s, a desire to increase the export of NFC orange juice from Brazil by sea led to advances in technologies enabling the integration of NFC seasonal storage and export by bulk sea vessels. This now facilitates the efficient handling and shipping of large volumes of bulk NFC from Brazil to the US and Europe. The major Brazilian juice producers are very large companies that have developed the logistics expertise needed for large-scale operations. They have their own port terminals and run a fleet of “citrus” tankers dedicated to shipping frozen concentrated orange juice. Today, some companies also have aseptic storage capacity at ports for exporting NFC. After extraction at the processing plant, pre-pasteurized juice is cooled to 0°C and then transported by insulated road tanker (25 tonnes) to the dockside storage facilities. After final pasteurization, the juice is stored in enormous aseptic tanks, each of up to 6 million litres volume (1.5 million US gallons), until exported. The aseptic tanks are located in insulated refrigerated storage areas where the temperature is maintained at 0°C. Investments in the port facilities provided the technical solutions required to integrate juice storage with aseptic shipping conditions. Initially, existing ships were rebuilt for transporting bulk aseptic NFC, but in the early 2000s new ships were built and launched specifically for carrying NFC along with FCOJ. These new ships can take up to 35,000 tonnes of FCOJ and NFC each. They are more than 200 metres long (about the length of two soccer pitches) and 30 metres wide. Each ship contains four insulated refrigerated holds with several freestanding cylindrical tanks in each hold. Some tanks are dedicated to NFC and others can carry either frozen concentrate or NFC. Sloping bottoms ensure that the tanks can be completely drained. The orange concentrate is loaded and transported at -10°C while NFC is shipped at a nominal 0°C. Individual bulk tanks are maintained under continuous nitrogen pressure, even during loading/unloading when nitrogen is exchanged with dockside tanks. For the return trip to Brazil the empty tanks are filled with nitrogen. Each ship is equipped with its own sterilization system for the bulk tanks, and the piping system is sterilized before juice transfer. Aseptic seals are maintained on tank valves throughout the journey. The import terminals have special facilities to allow aseptic unloading of NFC and routing it to dockside aseptic storage (see section 6.5.2). To reduce the costs of empty return voyages, the citrus tankers can also take on-deck freight containers (dry and refrigerated). Although these dedicated ships and specially equipped terminals require large investments, they result in more cost-effective storage and transport of large NFC volumes. For concentrate, it is obvious that bulk shipping is more cost-effective than shipping reconstituted juice in retail packages because shipping volumes are 5-6 times smaller with concentrate. For NFC, however, the volumes are about the same whether shipped in bulk or retail packages. Nevertheless, for long-distance overseas transport, shipping of bulk product for retail packing in the consumer market provides economical advantages. Bulk packaged NFC can maintain a long shelf life, whereas after retail packaging in non-aseptic packages its shelf life is relatively short. The transport chain eliminates a month of the shelf life in retail packaging. Shipping of retail packages requires additional outer packaging to protect the packages. In addition, it is not possible to respond quickly to market demands due to the long lead time required to get retail packages to the consumer. The product sales price usually includes the cost of the bulk package, and often the transport costs to the import harbour (for example, cost-insurance-freight (CIF) Rotterdam). The rates for sea freight depend on current supply and demand, and may vary significantly over time. For product that can be stored, shipment planning aims for periods of low freight demand and hence lower rates. Generally, rental rates for refrigerated containers are double those for regular (dry) containers. Calculated per tonne of product, freight costs for frozen break bulk (in 200 litre drums) are between the respective costs for refrigerated and dry containers. Rates for 40 ft containers are typically 20-40% higher than rates for 20 ft containers. Although 40 ft containers provide twice the shipping volume, their maximum weight load is typically 27 tonnes compared to 22 tonnes for 20 ft containers. In assessing the alternative giving the lowest shipping cost per tonne product, weight limitations need to be taken into account. The density for single-strength juice, such as NFC, is about 1.04 tonnes/m3 but about 1.3 tonnes/m3 for concentrate. Moreover, drums make less efficient use of shipping volume than rectangular bins. For this reason, drums of frozen NFC are usually shipped in 40 ft containers because a 20 ft container would not reach the maximum weight limit when fully loaded. Dedicated terminals for receiving bulk frozen concentrate are found in large ports in the Netherlands (Amsterdam, Rotterdam) and in Belgium (Ghent, Antwerp). Such terminals are also found in Florida, New Jersey and in a few major ports in Japan. Below, an example of a terminal (Ghent in Belgium) equipped to handle bulk FCOJ from a tanker ship is described with reference to Figure 6.4. 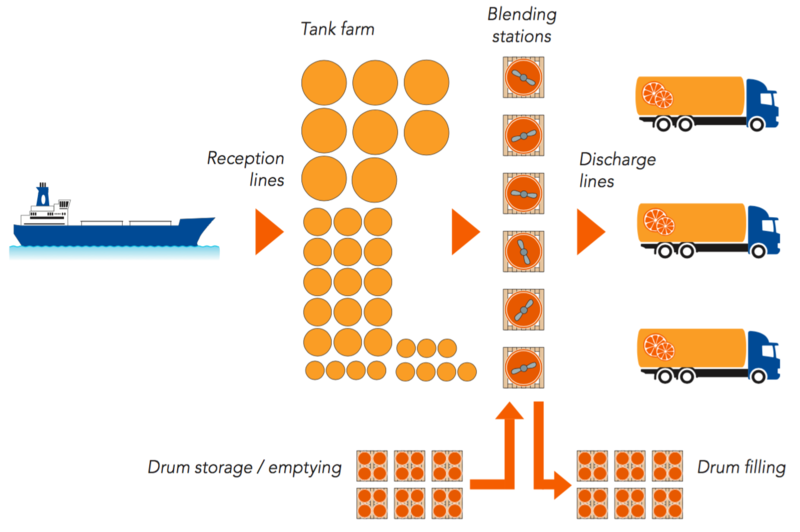 From the tanker ship, orange juice products are pumped into six reception lines which feed the 34 storage tanks on land (the largest of which has a capacity of 2,000 tonnes). From bulk storage in the tank farm, the juice products are pumped to six blending stations. These mix concentrates of different types to ensure that products meet customer specifications. Peel oil and other flavour fractions may also be added. The blended concentrate is then pumped to one or more of nine discharging lines used for filling road tankers for product distribution around Europe. In addition to concentrate, specialty products such as peel oil are also pumped from the tanker ship to storage tanks at the terminal, though in smaller volumes. A nitrogen system at the terminals is used to ensure that storage tanks always contain a nitrogen atmosphere, both when empty and when being filled with product from a tanker ship. The terminals normally also store large volumes of raw material and finished product in frozen drums. Raw materials from emptied drums are blended in the blending stations with concentrate from tank storage. Blended products are packed in drums and distributed frozen to juice packers. Operation of a terminal, as described in the example above, requires a practically unlimited choice of product routes. Therefore it needs to be controlled by a modern automation system which allows the operators to get a rapid overview of pumping operations at all times. Online communication of the control system with the scheduling and commercial departments is also important for this type of operation. NFC in frozen drums and aseptic bag-in-box bulk containers can be unloaded at standard terminals having refrigerated and frozen warehousing. However, special terminal facilities are required for NFC transported in bulk aseptic tanks on ships. Facilities for the aseptic unloading of orange juice were installed in Florida and Europe in the early 2000s in response to the use of bulk aseptic seagoing vessels. As at the juice export ports, aseptic storage tanks – usually of stainless steel – are installed at the dockside. However the total number of tanks and the size of individual tanks are smaller because storage is only required to cover production between ship arrivals. Before unloading the ship, juice samples from onboard tanks are checked to confirm that the juice is microbiologically acceptable. The piping system is sterilized before aseptic juice transfer from onboard tanks to dockside storage. In a similar way to FCOJ terminals, a nitrogen system provides nitrogen pressure to the entire installation of tanks and piping. In the juice reception area, a standby pasteurizer is used when necessary to pasteurize incoming juice or the content of a storage tank. But in well-designed and effective facilities, this emergency pasteurizer should never need to be used. Juice in dockside tanks is sampled regularly to verify that their contents are microbiologically acceptable. The juice from tank storage is dispatched by road tanker, hygienic but not aseptic, to juice packers. Blending of NFC may take place before dispatch (see section 6.6). At the juice packing plant, blending of orange juice and the addition of pulp may be carried out before repasteurization and retail packing. At a NFC port terminal in Belgium, facilities for retail packaging of the juice are located at the same site, thereby eliminating the extra bulk road transport step and reducing the costs of delivering NFC juice products to consumers in Europe. The design requirements for terminals handling bulk aseptic NFC are high. Operations are complex and much effort is spent in minimizing the inherent high risks. Experience gained from aseptic processing plants and NFC storage facilities in Florida has been vital in the construction of European terminals. Modern control system and automated valve configurations ensure correct operation. Online networking between all departments of dockside juice-handling facilities is also important to ensure smooth operations. And as with export terminals, initial investments are high but result in cost-effective handling of bulk NFC volumes once the installations are in place. Blending houses supply concentrates (and NFC) of defined and consistent quality to juice packers. They also prepare bases for beverage producers. Products supplied from blending houses are often made to customer-specific recipes. A wide range of raw materials is used by blending houses to prepare the concentrates and bases, such as different fruit juice concentrates, flavour fractions, oils and pulps. High-volume fruit juices, such as orange and apple, are taken in from bulk storage tanks while other raw materials come in frozen drums, aseptic bags and various smaller containers. Normally, the orange products used by the blending houses come from a larger number of countries than those used by the terminals. Blending stations form the heart of blending operations. As at the terminals, blending of FCOJ and other very viscous concentrates requires very powerful mixers. Raw material supply to the blending units comes from tank storage, drum emptying and drum crushing (if the product in the frozen state is not pumpable). After blending, the product is packed in drums or pumped into road tankers. Sometimes the final product is pasteurized after blending but prior to distribution (for instance in aseptic bags). More commonly, pasteurization is not carried out but raw materials are maintained at low temperature (<0°C) during blending and the finished products are distributed frozen. Soft-drink bases may include preservatives to make them shelf-stable. Strict quality hygiene control and cleaning-in-place are indispensable to blending house operations. They are necessary to avoid an increase in microbial load on products, and to prevent a batch of juice of poor microbial quality from contaminating subsequent batches. Laboratory analysis plays an important role. Quality control procedures include authenticity testing of the wide range of incoming raw materials. Finished blended products also undergo testing to ensure they meet the agreed specifications. Blending procedures require specialist know-how on the products manufactured and their intended use. This competence forms a valuable part of the service offered by blending houses to their customers, along with the development of proprietary recipes. Some of the FCOJ terminals also include the functions of blending houses and manufacture products according to customer specifications. Blending houses supply concentrates (and NFC) of defined and consistent quality to juice packers.